Mouse anti Human CD62P antibody, clone Psel.KO.2.12 recognizes the CD62P cell surface antigen, a ~140 kDa glycoprotein also known as P-selectin. CD62P is expressed by activated platelets and endothelial cells, and plays an important role in adhesive processes between leucocytes and endothelial cells. Mouse anti Human CD62P antibody, clone Psel.KO.2.12 inhibits P-selectin-dependent adhesion between HL60 cells and P-selectin transfected COS cells (Massaguer et al. 2000). Spleen cells from immunised CD62P knock-out mice (Strain C57/B6) were fused with cells of the NS-1 myeloma cell line. Massaguer, A. et al. (2000) Production and characterization of monoclonal antibodies against conserved epitopes of P-selectin (CD62P). Tissue Antigens. 56 (2): 117-28. Massaguer, A. et al. 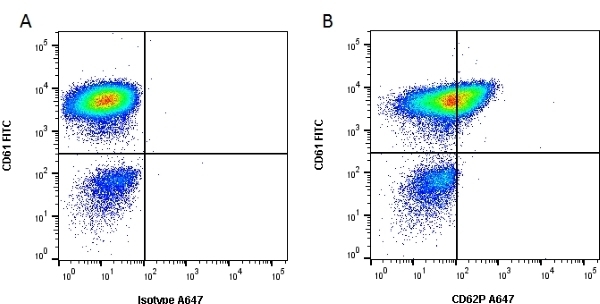 (2003) Characterization of platelet and soluble-porcine P-selectin (CD62P). Vet Immunol Immunopathol. 96 (3-4): 169-81. Massaguer, A. et al. (2002) Reactivity of CD62P workshop mAbs with resting and activated platelets from different animal species. In: Leucocyte Typing VII. Edited by Mason, D. et al. Oxford University Press, pp 342-3. Major, T.C. et al. (2010) The attenuation of platelet and monocyte activation in a rabbit model of extracorporeal circulation by a nitric oxide releasing polymer. Johnson, C.A. Jr. et al. (2008) Flow cytometric assays for quantifying activated ovine platelets. Johnson, C.A. Jr. et al. (2011) Platelet activation in ovines undergoing sham surgery or implant of the second generation PediaFlow pediatric ventricular assist device. Artif Organs. 35 (6): 602-13. Johnson, C.A. Jr. et al. (2011) Biocompatibility assessment of the first generation PediaFlow pediatric ventricular assist device. Artif Organs. 35 (1): 9-21. Dasse, K.A. et al. (2007) Assessment of hydraulic performance and biocompatibility of a MagLev centrifugal pump system designed for pediatric cardiac or cardiopulmonary support. ASAIO J. 53 (6): 771-7. Ding, J. et al. (2015) Quantification of Shear-Induced Platelet Activation: High Shear Stresses for Short Exposure Time. Artif Organs. 39 (7): 576-83. Tran GT et al. (2010) Membrane attack complex of complement is not essential for immune mediated demyelination in experimental autoimmune neuritis. J Neuroimmunol. 229 (1-2): 98-106. Foruzanmehr, M. et al. (2014) Nano-structure TiO2 film coating on 316L stainless steel via sol-gel technique for blood compatibility improvement. Nanomedicine Journal 1 (3): 128-36.